BRECKENRIDGE ” A local real estate agent has put a unique twist on efforts to sell a pair of properties near the Breckenridge Ski Area base. Tracey Woods, of Breckenridge Associates, is offering the 10.33-acre Ski Run Retreat parcel and the 17-acre Ski Run Ranch parcel for 4.4 million dollars in a “Dutch” auction, with a weekly price reduction until an acceptable bid is reached. “It’s an incredible opportunity. People are following it,” Woods said. She described the two parcels as the largest tracts of private land available for sale anywhere near a major ski resort. “It’s used in other parts of the country. “It’s a commitment to lower the price each week,” she said. The Ski Run Retreat property is a 10-acre mining claim surrounded by national forest land. The inholding is between existing ski runs on Peak 7 and what could be a pod of proposed new trails on Peak 6, pending U.S. Forest Service review and approval of a proposed ski area project. 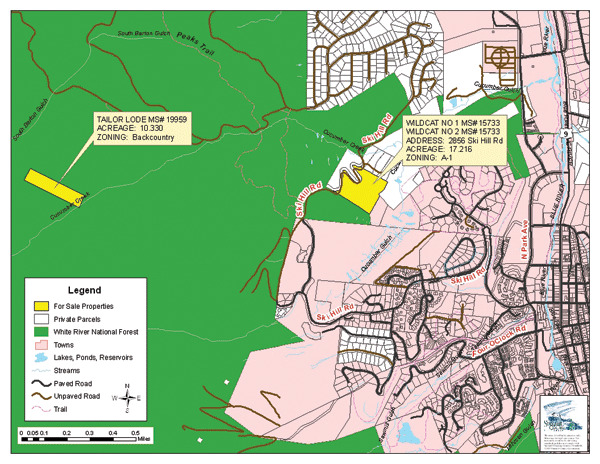 Since the land is surrounded by national forest, development would require a Forest Service special use permit for a road. Federal law requires the agency to provide for reasonable use and enjoyment of the property, to be determined by an environmental study, according to Paul Semmer, a land specialist with the Dillon Ranger District. The agency has identified the parcel as suitable for acquisition, potentially as part of a land trade. Breckenridge Ski Area officials said the parcel doesn’t figure into the resort’s development plans. Vail Resorts made a bid for the land several years ago, based on its perceived open-space value. The land is in Summit County’s backcountry zone, a designation that restricts building size and puts some conditions on access. The county’s open space advisory group has discussed the land a few times, but the asking price is too high, according to Art Girten, a local real estate agent and member of the open space council. Despite the development limitations, the location of the parcel still makes it a plum, Girten said in an interview last summer. Development and access restrictions are only part of the valuation equation for this type of property, according to Girten. The value of a private parcel so close to a major resort is more tied to what someone is willing to pay, Girten said. “These kind of properties are so rare … If this were Aspen, someone would build a heli-pad. We’re not there yet, but we almost are,” Girten said, several months before the local real estate market slowed significantly. The 17-acre Ski Run Ranch, formerly known as the MBJ parcel, is closer to the Peak 7 base area. Eight acres of the property is protected by a conservation agreement that was reached when Vail Resorts owned the property. During previous development reviews, the land was looked at. Although it’s close to the Peak 7 base area, it didn’t fit into the resort’s development plans, said Vail Resorts vice president Alex Iskenderian. “It’s a beautiful piece of land. The challenge is, a lot of the property is encumbered with conservation easements and there are quite a few wetlands,” Iskenderian said. “It’s a good spot for one home. It’s a rare thing to find 17 acres in that location,” he said. Based on his knowledge of the property and local development codes, Iskenderian said someone could probably build a 5,000-10,000-square-foot single-family dwelling on the parcel. The Ski Run Ranch property is in the county’s A-1 agricultural zone, with a 20-acre minimum lot size. Developments on smaller parcels require a special review by planning officials to determine a building envelope and to consider setbacks and other criteria, especially with regard to wetlands. Based on the size of the tract and the zoning, it’s unlikely that anything other than a single-family home could be built on the land, said county planning director Jim Curnutte. Any type of commercial use would require a rezoning, and that would be significant hurdle, given current master plan direction for the area. Along with its proximity to the ski area base, the parcel is also close to the prized Cucumber Gulch wetlands, a valuable natural resource area owned by Breckenridge. The town’s open space department has expressed concern about potential development on the land and worked with the county previously to protect some of the environmental values by setting aside parts of the property for wildlife movement. “It’s definitely an important wildlife area,” said Heide Andersen, director of the town’s open space program. “It’s a movement corridor for deer and elk. We want to somehow have those values protected.” The impacts could be minimized with careful development, including a well-placed building envelope and setbacks from wetlands and other sensitive areas, she said. Even in today’s shaky economy, the two parcels together present a one-of-a-kind opportunity for an investor, said broker Woods. “It’s so unique. I also envision the corporate retreat concept that he (Iskenderian) mentioned,” Woods said, singling out a few other high-end residential subdivisions nearby, where land prices are in a zone similar to the current asking price for the pair of properties near the ski area. “Both pieces together become a legacy situation,” she said.